To level a surface by working in loose material. Double sided lutes have completely different profiles. 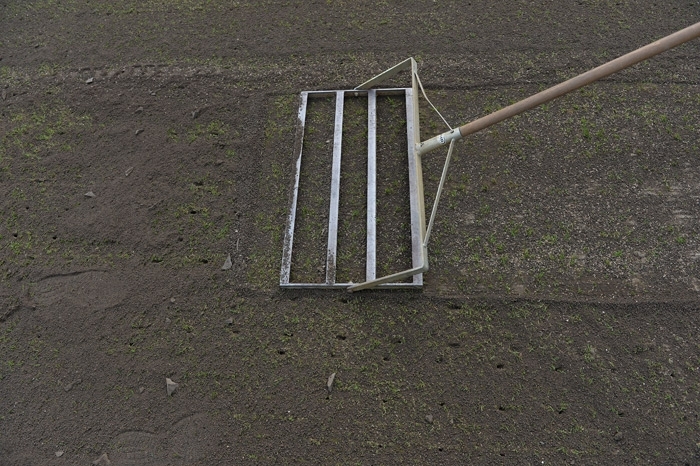 One side has smooth edges for spreading top dressings and levelling. The other side has sharp edges for working in top dressings and maintenance such as cutting back high spots. Any time of the year when the surface is dry. Uneven ribbed surface with dressing thicker in places. Grass plant death due to being smothered by dressing. A lute. These vary in size from hand versions to tractor mounted. Finish working in top dressing on a pitch by luting down the length of the pitch.